Women’s football in Canada has come a long way since the first women’s team was formed back in 2007 in preparation for the Northern Light’s first ever international against the USA Freedom. They lost that match, but didn’t lose the desire to continue the push to expand female football across Canada. With the confidence of their 2011 International Cup performance where they were runners up to Ireland, the Northern Lights are coming over to Australia with the intention of going one better at IC14. And this time they have some extra friends with them. As PNG, NZ and Europe all withdrew teams from the women's division a decision was taken by AFL Canada to send a second women's team as they had a large number of talented players that were keen to make the trip who had missed out on Northern Lights selection. The Midnight suns will not only represent Canada proudly but will be looking to show that they can match it with both the other countries and those selected before them for Canada. 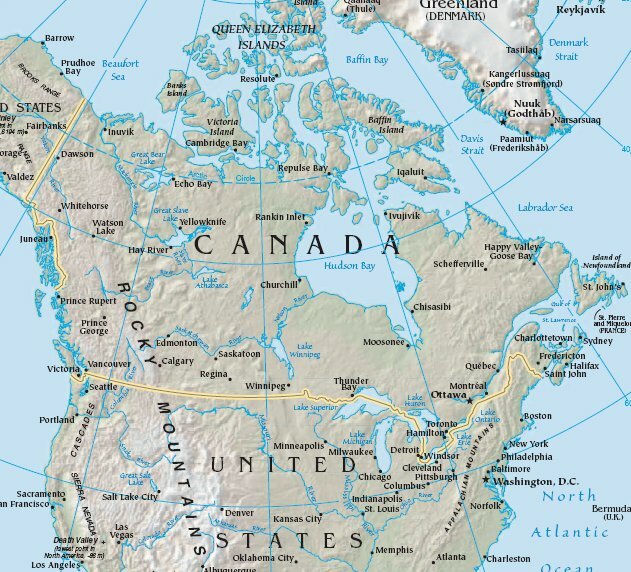 Canada is comprised of ten provinces and three territories. The official languages are English and French, which is spoken in the eastern state Quebec. Ottawa, in Ontario, is the capital city, though the largest city is Toronto, further south in Ontario near the USA border. Canada has an area of 9,985,000 square kilometers, but large areas of the north are covered in glaciers and permafrost and one could say are mostly uninhabitable. Canada’s population is 34,523,000, and a population density of 3.41 people per square kilometer means recruiting players from outside the larger cities is difficult. Canada’s national symbols are influenced by natural, historical and Aboriginal sources. An example is the maple leaf used on the national flag, and the Team Canada emblem, a totem pole style eagle. Before the women’s team adopted the uniquely Canadian “Northern Lights” moniker, they were called the Eagles. Canada’s official national sports are ice hockey and lacrosse, and other popular sports include curling and Canadian Football. Canada has hosted several high profile international sporting events, including the 1976 Olympics, the 1988 and 2010 Winter Olympics, and the 2007 FIFA U20 World Cup. Canada borders with the USA on two sides (mainland USA and Alaska) and the two countries have a long history of collaboration. AFL is no exception. Every year, a national team from the USA plays against Canada in the “49th Parallel” Cup. The Northern Lights have also competed against the USA’s national women’s team, the Freedom, in 2007 and 2010. Women’s football in Canada dates back to 2004 when a Toronto team, Etobicoke Kangaroos, held a development clinic at two local girls’ schools. At the end of the clinic, the two schools played each other- the first ever all female Australian football match played in Canada. Three years later in 2007, women’s football took another step when the USA Freedom challenged Canada to a women’s international match before the 49th Parallel Cup in Vancouver. In preparation for the match, the first Canadian women’s team, the Calgary Kookaburras, was formed in Alberta. The national team comprised of 14 Calgary Kookaburras players, and 6 players from Vancouver, and lost two matches against the USA Freedom, but the Kookaburras were later invited to participate in the 2007 USAFL Women’s National Championships in Louisville, Kentucky. Following the success of the Kookaburras, Alberta again led the way in the development of women’s football in Canada with the establishment of the first women’s football league in 2008. The Hillhurst Nighthawks won the inaugural Alberta Premierships, and the Calgary Kookaburras were again invited to the USAFL Women’s National Championships, in Colorado Springs, where they defeated the Atlanta Lady Kookaburras in the final. The Edmonton Emus joined the Alberta league in 2009, and competed against the Calgary Kookaburras and Vancouver’s West Coast Wildcats at the Canadian Women’s National Championships. Following this success, two more provinces, Ontario and Quebec, formed their own women’s football teams, the Toronto based Central Blues and the Montreal Angels. Today, women’s football is played in 4 of Canada’s provinces and territories- Alberta, British Colombia, Ontario and Quebec. Current teams are the Calgary Kookaburras and Edmonton Emus (Alberta), West Coast Wildcats (British Columbia), Toronto Central Blues and Toronto Eagles (Ontario), and Montreal Angels (Quebec). Canadian women’s team ‘The Northern Lights’ return to Melbourne for IC14 aiming to improve on their great debut performance in 2011 where they were runner-up to the Irish Banshees. Led by new Head Coach Jason Arnold and Assistant Coaches Greg Everett and Dave Kalinowski the Northern Lights have hit the training track hard for the past two years with IC 2014 in mind and hoping to go one step better. The road to IC14 really kicked into gear back in August last year, where the Lights dominated the USA 13-9 to 0-1 in Edmonton to regain the Parallel Cup. What made that performance more impressive was that the team was missing a number of its key players including Captain Aimee Legault, IC11 World team selection Sarah Ennor, key defender Lara Hilmi and speed machine Heather Walshe. The Lights play the USA Freedom first up on August 10th in what is expected to be a much tougher game than that experienced last August. The Lights then play USA Liberty, Fiji and Tonga to complete the first round with their ultimate aim a Grand Final birth and a tilt at the title. Lara Hilmi – Best and fairest last year for her home club Sydney Shamrocks. Selected on the halfback flank in the Sydney AFL ‘Team of the Year’. Recently represented the Sydney league and was one of their best players in the win over Canberra. Rachelle Chabot – Calgary Kookaburras Captain is in career best form after a huge pre-season. Her rock like defence and run out of the backline is something to look out for. Jen Nichols – The Central Blues mid fielder has had a great season off the back of winning her club best and fairest in 2013 and is looking forward to having a big impact at IC14. There was no better indicator of the depth of women’s footy in Canada than when the news reached AFL Canada that there may a possibility of an additional team being accepted for IC14. There was an overwhelming response by players from across the country, and within hours, there was enough interest to field a second Canadian team and the Midnight Suns were ultimately accepted into the tournament. The Suns will be coached by IC11 Lights Assistant Coach Mark Peterson and will be supported by Assistant Coaches Peter Maloney and Murray Fielding. The Midnight Suns started as a development squad, which first played at the Parallel Cup in Ohio in 2012 and again last year in Edmonton. While many of the players have yet to play side by side, they are united by their determination, passion, and excitement for the game and the opportunity to represent their country. Chantal Beaudin – Playing for Queensland University, Chantal has had a great rookie season and really impressed with her fitness, speed and overall skill. Haley Fanning – A recent rugby convert from Edmonton, Haley has had a fantastic season for her local club and is looking forward to testing herself against the best from around the world. Emily Legault – Emily is in her second season with the Montreal Angels and is a player on the rise. A strong key position player, Emily will play a key role for the Suns. The Northern Lights have a fair idea of what it will take to win IC14 after taking it up to the Irish Banshees at IC11. Tough tackling Fiji and Tonga may make put the Canadians off their game but their experience and skill should show out. Then there is the grudge match against their American neighbours where all history is just that. We think the Northern Lights will outshine the Suns as would be expected and a top two finish is definitely a possibility again. . Thanks to Jason Arlnold and Harley Vague for their submissions for this preview.